Like previous famous barges before it, Google's barge on the east coast is about to meet an ignominious end. After months of speculation about what its ultimate purpose would be the Portland, Maine Google barge is headed for the scrap heap, literally. The east coast barge was recently towed from Portland to a cargo terminal in South Portland. The barge is now being prepared for an ocean voyage after being sold to a new owner. But before it goes the 63 shipping containers that make up a 4-story building on top of the barge will be disassembled and scrapped, according to The Portland Press Herald. Google's west coast barge, meanwhile, has moved from San Franciso to Stockton, California with its dock fees paid up to October. In late 2013, two large, mysterious barges appeared in San Francisco and Portland, Maine. Stacks of shipping containers were hauled onto both barges to create four-story buildings. The barges were quickly connected to Google and the speculation about what they might be exploded from there. 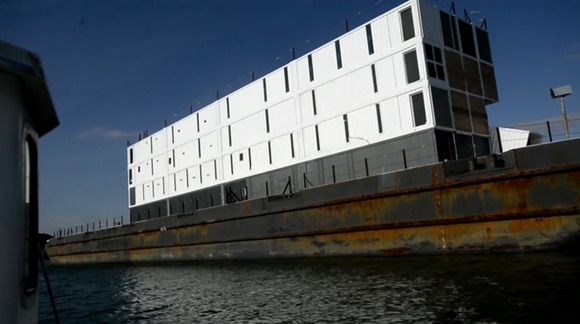 CNET originally wondered if the west coast barge might be a floating data center cooled by seawater. Others thought it might be some kind of special events boat or a store for Google Glass. That last bit of speculation turned out to be the closest. In November, Google told TechHive that the barges would be "an interactive space where people can learn about new technology." Although Google's comments did dampen the enthusiasm of some barge speculators, others wondered how far these showcases would go. Would they just be for Google Glass, Android phones, and other standard Google projects? Or would previously unknown technological delights from the Google X division amaze barge visitors? Now it seems we'll never know for sure—unless the Google's west coast barge somehow dodges its cousin's gloomy fate. Google Glass' own future looks increasingly cloudy as well, with its short history marred by bans in private establishments and public uneasiness about it being a symbol of tech elitism.